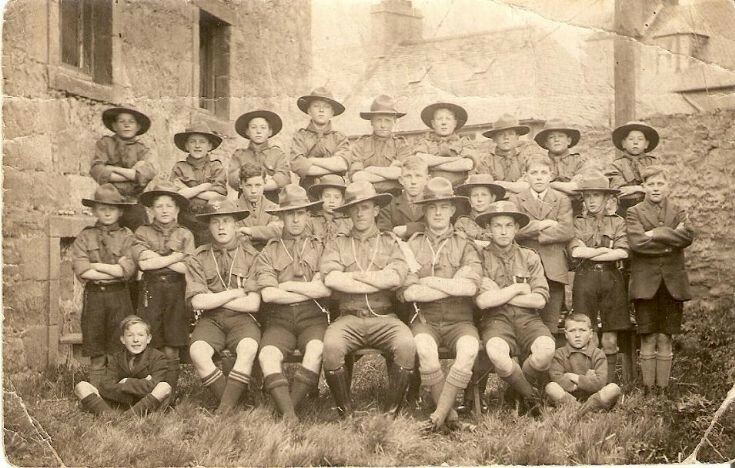 A photo of Cromarty Scouts and Cubs which I found among my Dad's papers. Possibly taken around 1920. He wrote names on the back, but not in order, and not everyone! Names listed are: Tubbie Gape, Peter ((surname unclear, looks like Grearer? ), Andrew Skinner, Evan Ferguson, James H Grant, D C Ross (my Dad), Johnnie Grigor, Walter Brindle, John McIvor, Alick MacKenzie, Willie Durrant, Alist. Shepherd, Ross Tulloch, John MacDonald, Edwin Urquhart, Ken Sutherland, Willie Grant, Roy? Farquhar, Jimmy Shepherd, Duncan Robertson, Colin MacKenzie and John McIvor. Any clarification of who is who would be appreciated!! Hi, the boy in the middle row, 3rd from right is my Grandmother's Brother, Ken Sutherland. Ken was born in 1909 and lived in Cromarty Mains farm cottages along with his Father Kenneth Sutherland, farm manager, his Mother Catherine Sutherland, and his Sisters Mary Sutherland (my Grandmother) and Williamina (Mina) Sutherland. Young Ken grew up to be a Police Inspector. If anyone knows anything about my family please can they get in touch as I'm researching my family tree. Thanks.